After ensuring the desired debug startup option has been set and ensuring the appropriate programmer/debugger has been chosen, a Debug Session can be started by clicking on the Debug Project Icon. An illustration of MPLAB X IDE's user interface immediately after a debug session has been started. This example shows the operation when the Debug Startup option is set to MAIN. When the program being debugged is not running, the location of the Program Counter is shown on the screen with a green line. When a debug session has been started, a new toolbar will appear. 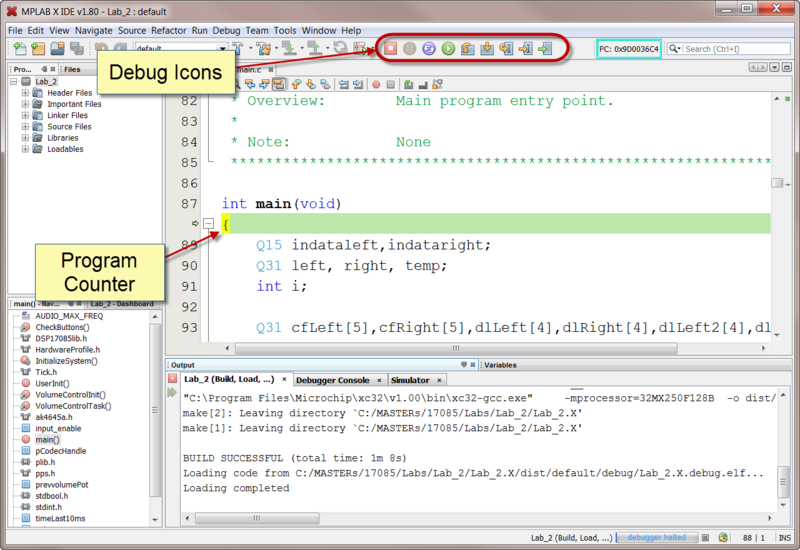 The Debug icon toolbar contains 9 buttons which allow for program control and ease of debugging. Global Variables (variable with fixed addresses and scope) can easily be viewed by the Watches window. When the Watches window is opened, you can add a list of variables to "watch". Each time the debug session pauses the program, the value of the items being watched is updated. PIC® Special Function Registers (SFR) work just like static variables and can be added to any Watches window. To open the Watches window, select Window>Debugging>Watches from the toolbar. The Watches window will appear as a tab in the lower left-hand corner (where the Output window appears). Right-clicking anywhere in the Watches window will allow you to add or delete Watches. Local Variables (variables that exist only on the stack) can be viewed by the Variables window. When the Variables window is opened, the variables who are local to the active function are displayed. You have the choice of selecting all local variables or just those near the program counter. To open the Variables window select Window>Debugging>Variables from the toolbar. Just like the Watches window, the Variables window will appear as a tab in the lower left-hand corner. The three icons on the left-hand side of the Variables window allow you to modify the range of the local variables displayed or to add Watches to the Variables window. Adding Watches to the Variables window allows one window to display Global variables, SFRs, and Local Variables. Some users find it easier to debug with only one window show data values. When debugging has been completed and you wish to create an image which can run in the PIC MCU without the need of a programmer/debugger, two steps are needed. The first step is to end the debug session. Once the debug session has been ended you will need to create the production-ready image. To end the debug session click on the 'Finish Debug Session' icon . The video provided is using an older version of the MPLAB X IDE. However, there have been no significant changes to the interface and you should be able to follow the procedures as shown.